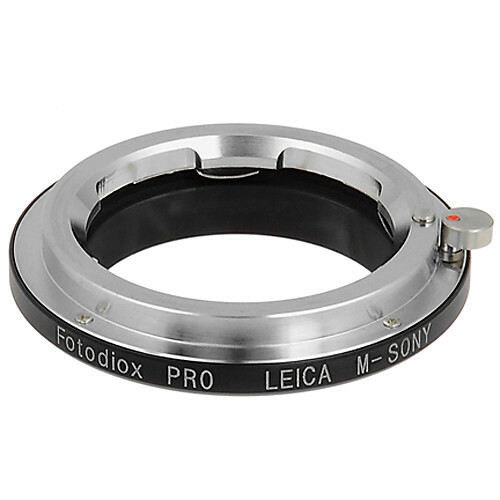 The Adapter for Leica M Mount Lens to Sony NEX Mount Camera from FotodioX allows a Leica M Mount lens to attach to a Sony NEX camera body. Adapting a larger format lens to a smaller format sensor provides optical as well as practical advantages. The smaller image field helps minimize the effects of lens distortion and aberration by using the center or "sweet spot" of the larger lens' image circle, thus providing edge-to-edge sharpness. This adapter is compatible with the following Leica M mount lenses: Leica M lenses, CL lenses, Ernst Leitz Canada's ELCAN lenses, Konica Hexar RF lenses, and Minolta CL, CLE Rokkor Lenses, Voigtländer lenses with the Bessa T, R2, R2A, R3A, R4A, R2M, R3M and R4M, Rollei 35 RF, Zeiss Ikon rangefinder lenses. Also works with Sony Handycams and Camcorders such as the NEX-VG10. Box Dimensions (LxWxH) 2.8 x 2.7 x 0.5"
Adapter for Leica M Mount Lens to Sony NEX Mount Camera is rated 4.0 out of 5 by 7. Rated 5 out of 5 by Jeremy from Works Perfect I went to B&H and tried every adapter they had and found this to work best. All other adapters were either made of plastic, were really hard to attach/detach, or had a difficult lens release button. This adapter is made of metal, is easy to attach to camera, and easy to attach and detach lenses quickly. Does exactly what it is supposed to do! My only complaint is that the adapter is silver in color when facing outward, which is annoying and non-discreet when shooting street stuff. It's rather reflective and flashy. I wish they would have made it black like the rest of the adapter. Rated 5 out of 5 by Fred from So much better than @ junk I've tried the wobbly $ adapters from China. These Fotodiox adapters are soooo much better and still a great value. You get precision quality with no wobble and a spring-loaded latch you can count on. Rated 1 out of 5 by Anuar H. from Poor quality The lens doesn't fit as it should on the adapter. It feels a little loose, also because of this there is light leak coming from mount. Rated 4 out of 5 by Tinker from Does the job Using a Leica M lens on the Sony A6000, as well as Canon FD by piggy-backing a Canon/Leica M adaptor. Works fine. No complaints. Rated 4 out of 5 by Jerry from Works OK. Good value for the price. Though not as well finished as the more expensive adaptersit works ok & is a good value for the money. Rated 5 out of 5 by Stephen Kelly from Does the job Lower cost adaptor for Leica M to Sony a7 body. Works well as expected. No complaints. Rated 4 out of 5 by William from I would buy this again. Good bang for your buck. Does it allow close focusing say 0.7m and less? Sorry. I have not done any closeups. Can you give me (LxWxH) for this adapter ? Because box dimensions doesn't help and are totally useless. Thanks. It appears to be 6 centimeters or 2 3/8 inches wide and the release tab projects out 3/16. Since it is a circle, it's the same in all directions. It is 9/16 of an inch thick or 1.5 centimeters. Of the several models available it doesn't look as attractive as, say, Novoflex--but it costs less and does the job just fine. Does it work for sony a7s? Yes. I use it on a Sony A7r and an A6000. It is a great adaptor. I love it. Just remember you have to be skilled in manual shooting. M42 to e mount adapter? This is not an M42 to E adapter. This is a M bayonet mount to E. M42 is threaded and for SLRs. This has tabs that lock together and for short flange distance rangefinder lenses.I've attached the correct adapter but there is a larger selection at amazon.